At One hour from your hotel in Guatemala City there is one of the three Active Volcanoes of Guatemala. 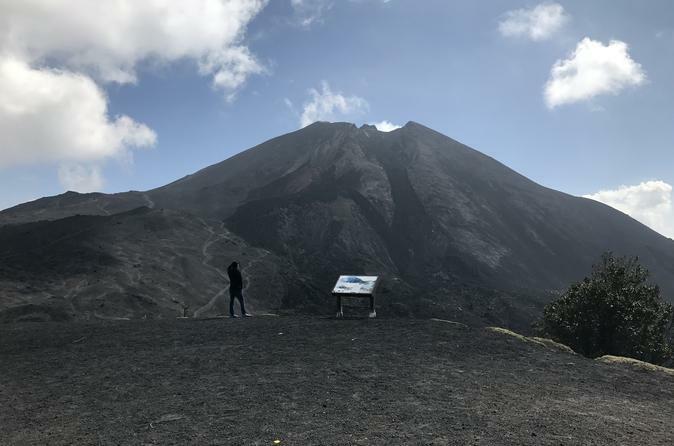 The visit to œPacaya Volcano consists on an easy hour and a half walk, which allows you to get to the paved area and enjoy an amazing view of the active crater. The upgrade path is a natural spectacle. Be picked up at your staying hotel in Guatemala City. Then we begin our journey to the Pacaya Volcano that its located at approximated 1 hour from the city. At your arribe you are going to be waited by your local guide to begin your walking tour. Climb to the top of one of three active volcanoes of Guatemala, the time to get to the top is an estimate of 1 hour and a half, The upgrade path is a natural spectacle so you can see all the plants diversity of the area. Then get your camera on to take the magnificent pictures that offers you the view of the top of the volcano, and enjoy the spectacular show from a safe distance fromÂ the active crater (50 m) . By the end of the journey we begin with our trip back to Guatemala City. *Optional: You can upgrade your experience opting by having lunch in a private Guatemala coffee farm and have a nice Coffee Tour, and of course taste the famous Guatemalan Coffee.